With 60 years of experience, KLEY France is a recognized provider in offshore, oil and gas, marine and oceanographic fields. Our range of products includes linear winches, risers pulling and mooring systems (RPS) for FPSO (floating production, storage and offloading), dedicated winch packages and handling equipment for marine and subsea research, including high-tech submarines. Our main applications are FPSO riser connection and mooring, pipe pulling and laying, deep sea research and coring, ROV and AUV launching (LARS). KLEY France entirely manages any project until turnkey delivery, including design and calculation, manufacturing, assembly, testing, commissioning and worldwide technical support. Our engineering skills and competences developed through decades of experience allow us to propose highly customised and top quality technical solutions for demanding applications. With more than 70 units operating worldwide over 40 years, KLEY France is the world leader in development of linear winches. We produced two units of 800t (world’s highest capacity) for heavy pipes pulling and tenths of units in the range between 10t to 800t. We recently delivered a complete set of linear winches and stationary grippers operating through multi-falls blocks for installation and operation of heavy closing panels on Chernobyl confinement arch. 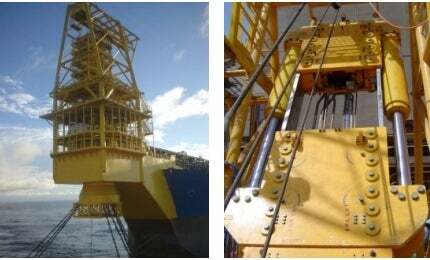 KLEY France supplied riser pulling and mooring systems, equipped with linear winches, for several FPSO units based in Brazil, Africa, Australia, Pacific and the North Sea. Linear winches can have different features as per application exact needs such as continuous or intermittent motion, socket passing possibility (under tension), horizontal / vertical positions, ATEX compliance, etc. KLEY France has a strong experience in the development of wide range of highly customised equipment in relation with handling and lifting. This includes handling systems for pipe laying stingers, traction winches (*), drum winches, spooling devices, welding rotators for piping works, heave compensators, cable tensioners, push-pulls, etc. All our packages are delivered with dedicated power and control units, including electric or diesel power packs (HPU), customised control containers. (*) In response to deep offshore needs, we have developed the Annular™ traction winch, dedicated to safe and proper fibre rope deployment (FRDS), with outstanding performances and field experience. Within a long partnership with major oceanographic research institutes and research vessel owners, KLEY France has developed high-standard and tailor-made solutions for demanding operations at sea, including deep sea winches, handling systems and coring systems. We develop deep sea winches with outstanding performances, fully dedicated to scientific operations and adapted to vessel characteristics. Our patented Annular™ traction winch technology is the world reference as far as synthetic rope deployment is concerned. We also offer a full range of CTD winches (equipped with slip rings), spooling systems and special purpose winches such as compensation, constant tension, hauling and deck manoeuvring operations. Handling systems include highly customised A-frames and LARS (launch and recovery system for operations with AUV, ROV, manned submersibles), telescopic booms, davits and sub-hull transducers deployments systems. Our expertise also includes corer systems and associated handling equipment such as A-frames, telescopic and rotative booms, corer telescopic support. Our Calypso™ piston corer, acknowledged by the length world record (65m of core), is considered today as a high quality standard for most of Research Institutes. KLEY France is ISO 9001 certified by DNV. Our projects are third-party certified in accordance with international offshore rules, such as Bureau Veritas NR526, DNV 2-22 lifting appliances, DNV 2.7-1 lifting certification, API standards and even Norsok standards. Our equipment are CE certified when appropriate, and can be designed for various demanding environments including ATEX, onshore, offshore and subsea. Our field engineers (highly skilled in mechanics, hydraulics, electrics, PLC and instrumentation) can be deputed worldwide on short notice. They hold the necessary documents to operate either onshore or offshore, including VISA, OPITO, medical certificates, basic offshore safety induction and emergency training (BOSIET) and helicopter underwater escape training (HUET). Greater Stella Area, which is located within the UK continental shelf in blocks 29/10a and 30/6a, is being developed by Ithaca Energy as the operator.